With all the press and panels other franchises have been giving at San Diego Comic Con, it seemed like DC’s latest big screen attempt Batman V Superman: Dawn of Justice was going to be one minor half reveal after another. Thankfully, they finally stepped up and gave us a look at the new film; and even though it wasn’t much, there was just enough to become intrigued over. A – VERY – small teaser was shown for the film which seems to show Batman and Superman about to throw down. In the scene, we saw a very beefed up and armored Batman casting the bat signal’s light up into the sky on Superman himself, who doesn’t look too happy – unless those heat beam eyes just mean he’s happy. The important thing to note in this scene is that this Batsuit doesn’t look like the one DC has been leaking bit by bit. This suit looks more armored and seems like a serious throw back to the iconic ‘Dark Knight Returns’ story by Frank Miller. From the bulky suit to the glowing white eyes, this is a Batman completely unlike anything we’ve seen before on the big screen. The other reveal for this panel was an image of Gal Gadot as Wonder Woman. The costume by itself looks very vintage and feels like it should be in the next 300 film. 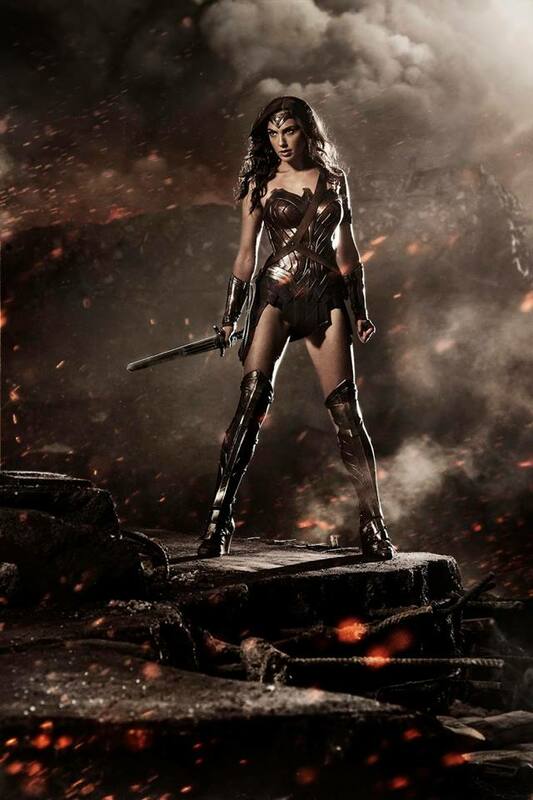 That being said, Gal just doesn’t have the look of Wonder Woman. Many have said that since she was first cast; but I was willing to give her the benefit of the doubt. Though after seeing this photo, I sadly don’t see it. Wonder Woman isn’t just a ‘beautiful brunette’. She has this look of confidence and air of empowerment around her. It’s hard to put it into words; but whatever it is Gal doesn’t show it in this photo. Hell, if anything this photo looks more like an image from a Halloween episode of Keeping Up With The Kardashians. All in all, the photos being released for this film make me more and more bored/weary with this film. On the other hand, the footage actually looks legit and interesting. Hopefully the film follows more of the teaser footage and less of the proposed ‘photo reveals’. Stay tuned for more updates. July 26, 2014 in DC. Tags: Batman V Superman: Dawn of Justice, DC, SDCC 2014, Warner Bros.